I would like to thank my readers, and almost 1500 Twitter followers, for their interest and support with the new blog which was launched in September. 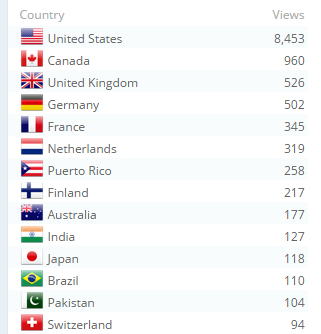 Here’s a snapshot of sources of readership over the past few weeks for countries that had more than 100 readers. I’m looking forward to the new year and rewarding your interest in nuclear energy with content worth your time. The list of referrers is too long to call out everyone. Just let me say thanks to all that posted links. See the blog roll here for the key sources.